By Mauro Tedeschini, et al. 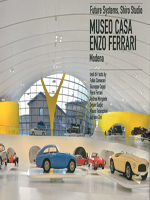 The museum house of Enzo Ferrari Modena is a museum complex that aims to celebrate motorsport and tell the world the story of a great man, man, driver and manufacturer. 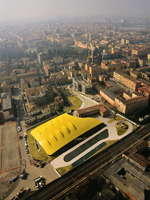 The exhibition complex built in the ruins of the house in which Enzo Ferrari was born in Modena in 1898, has been preserved intact over time is that the body of the building to the workshop, and the construction of a new building with a futuristic design, the famous "hood" in aluminum yellow color symbol of the city of Modena and color chosen by Enzo Ferrari as the background of the Horse, the brand of the company that bears his name. The book documents the design process that led to the construction of the new museum: the draft competition in which they took part imported internationally renowned architects and rewarded the work of the Anglo-Saxon studio Future Systems - which he held Jan Kaplicky - upon completion by Andrea Morante, the relationship with the customer, from the technological aspects and structural issues that make executive of the museum a new visual symbol of the city of Modena. 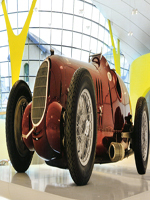 Monument to the dialogue between past and present, between passion and creativity, research and innovation, courage and challenge the museum identified by the profile of its automotive coverage affirms its identity by combining audacity of its architectural charm of dream cars that is called to guard.